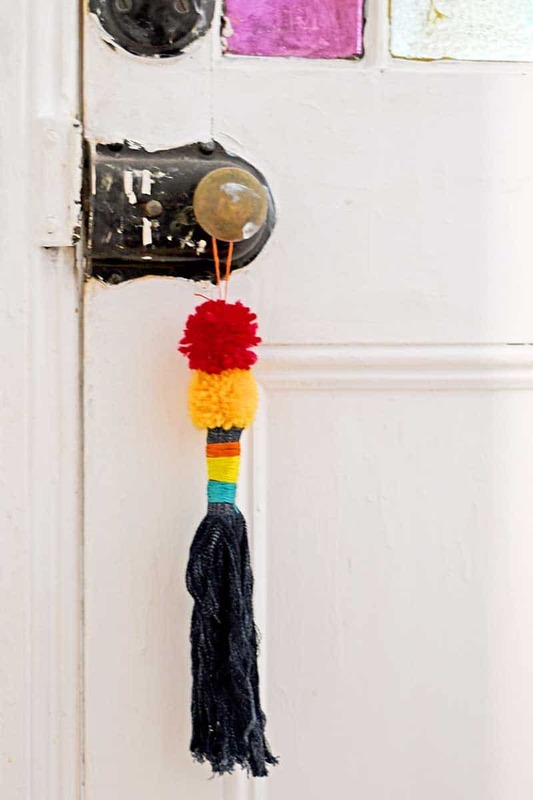 Tassels seem to be everywhere, they are the new pom poms. And I do love them! I was so happy when I worked out how to make tassels from my favourite material to upcycle, old jeans. Previously, I have made sweater felt tassels from repurposed scraps. Even though those tassels were a fun way to use up old felt scraps and were very colourful I think I prefer these denim ones. These denim tassels are made by fraying squares of old jeans offcuts. They are much more robust than other handmade tassels as the threads are still attached to the denim fabric. As with all my other denim upcycles, I love the different shades of indigo you get from old jeans. 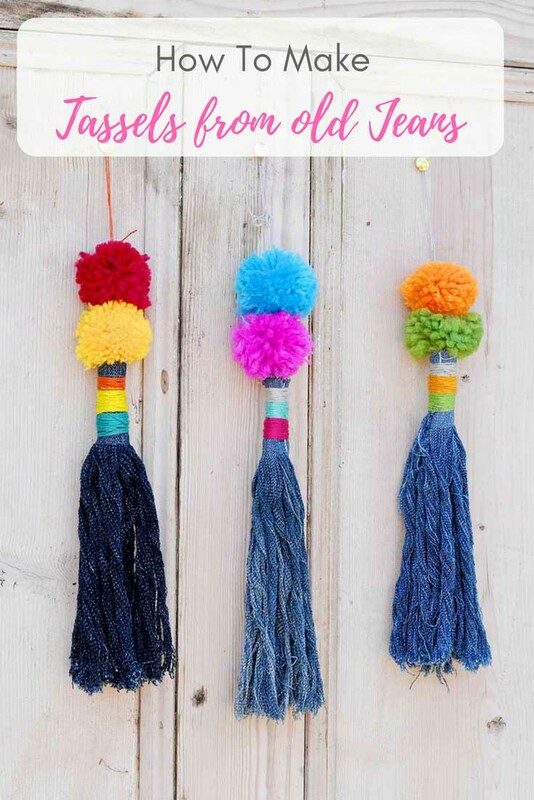 The great thing about this DIY tassel tutorial is that you can easily make the tassels in various sizes. So you can make large ones to use as curtain tie backs, smaller ones to fringe cushions and blankets. Or even smaller to make earrings and necklaces. I’ve even seen tassels of various sizes hung up as a unique wall decoration. This is what I call a Netflix craft. That is it doesn’t take much concentration so it can be done whilst catching up on a Netflix boxset. I, in fact, made these whilst watching the football world cup. Each tassel takes about 30 minutes to make. 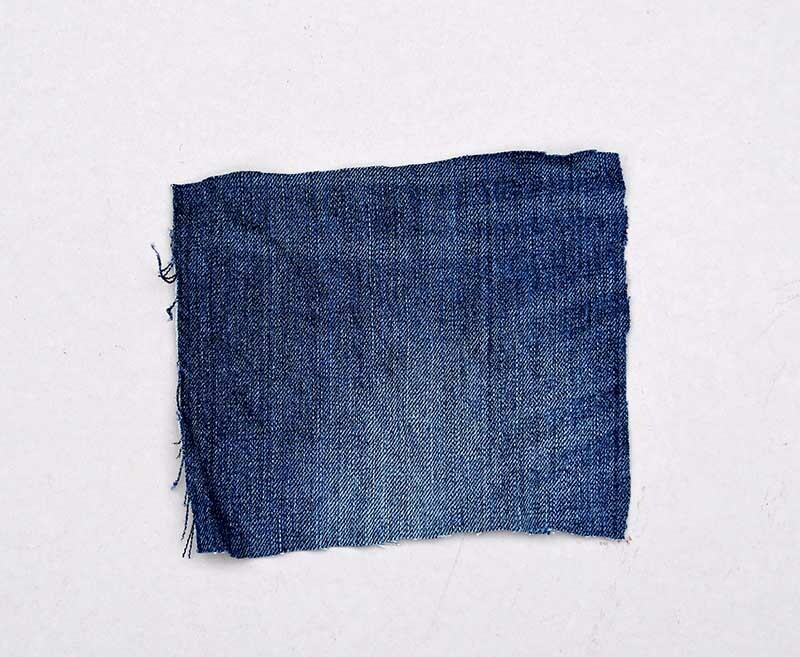 Scraps of denim from old jeans at least 12cm (5″) square. 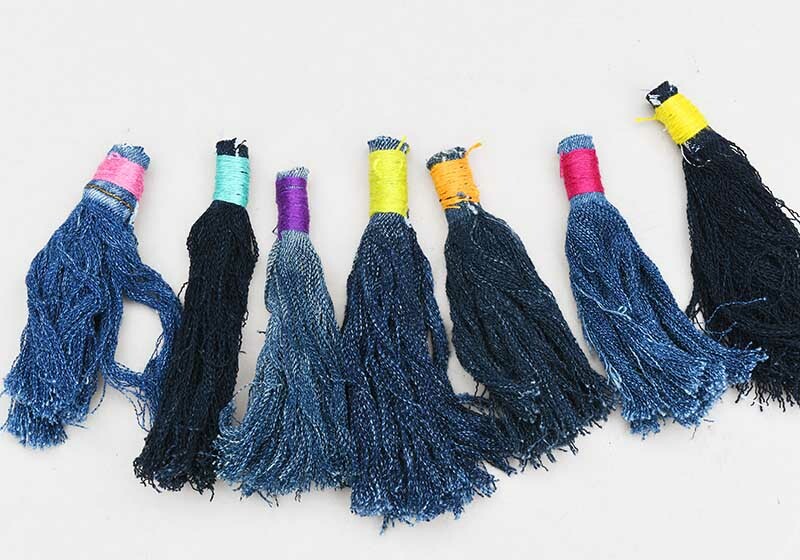 The size of the denim scrap will determine the size of the handmade tassels. First decide on what size you would like your tassel to be. As the size of the scrap piece of denim you choose will be the size of the tassel. If making denim tassels for a cushion I recommend using a scrap piece of denim approx 4 inches (10cm square). 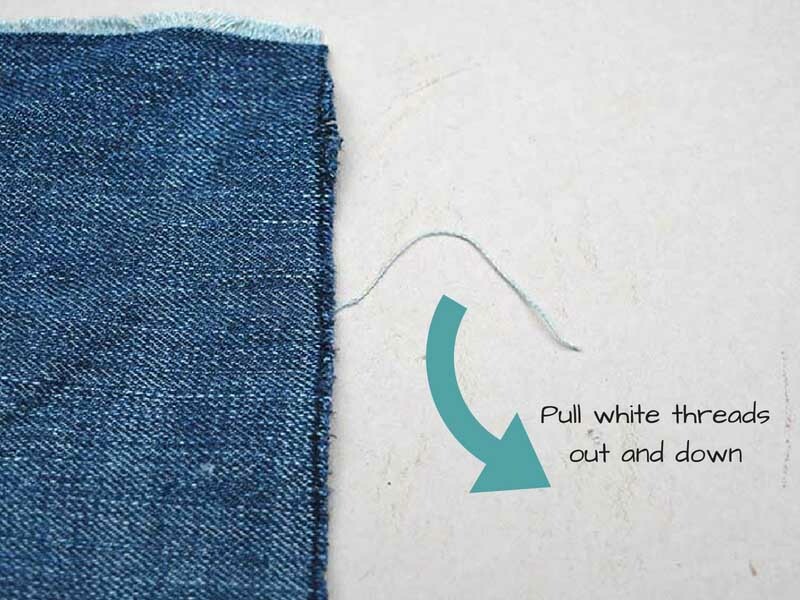 Pull some of the loose blue threads of denim to expose the white threads down one side of the scrap piece of material. 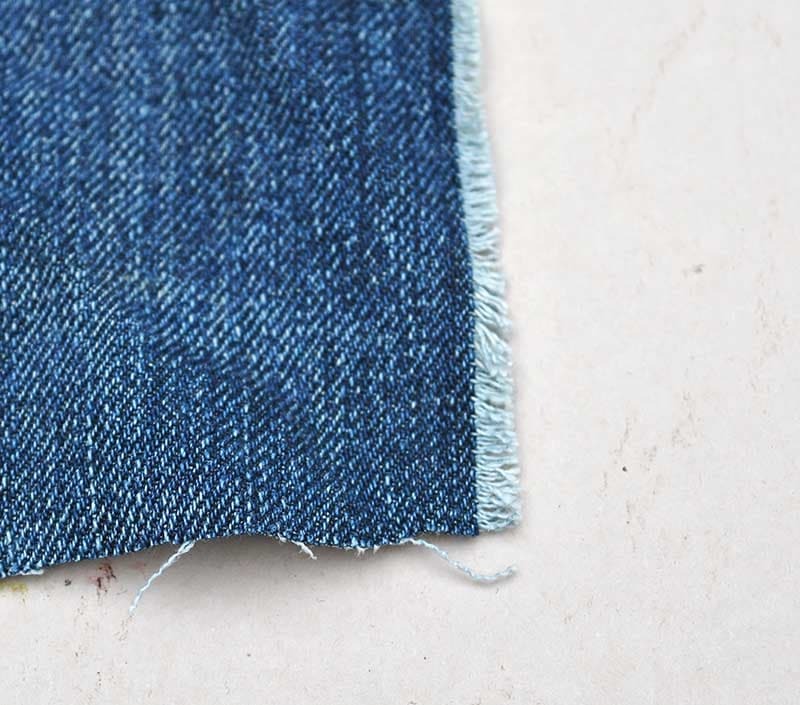 Denim is a woven material and the tassel is created by pulling out the white cross threads one by one. Grab the end of a white thread and pull it firmly away from the denim material untill it all comes out. Carry on pulling out all the white threads until you are left with approximately 2cm of material at the top. I found that with some denim I could pull more than one thread at a time. If the white thread snaps as you pull it out, just use a pin to find the end and pull it again. Next roll up the denim tassel tightly. 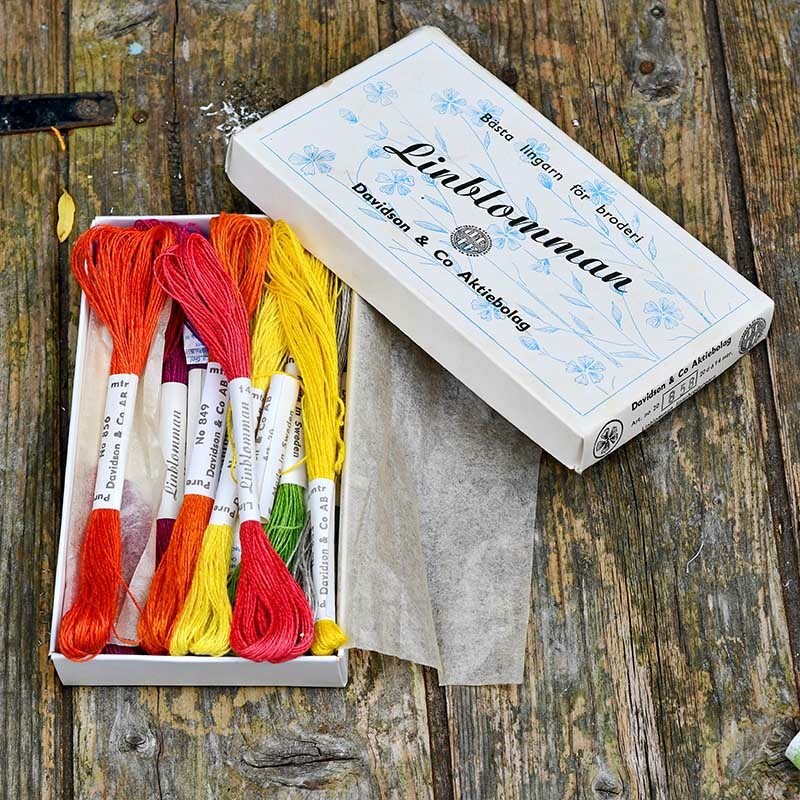 Using colourful embroidery thread and a needle hold the top of the tassel together with a stitch through the denim. Then wind the coloured thread around the top of the tassel and finish off with a stitch to stop it unraveling. Pom poms and tassels definately look fantastic together. 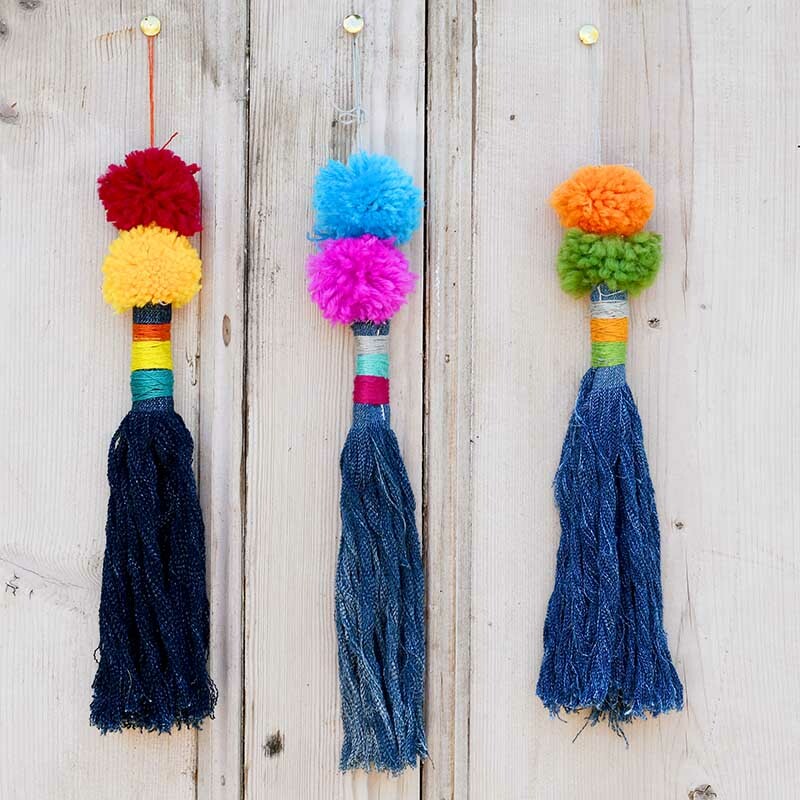 For my bigger denim tassels I added a couple of colourful pom poms to give them extra panache. I’ve just been hanging these on the doors for decoration for now. I’m on the look out for a nice rattan beach bag to addorn with these lovely tassels too. I just love the different shades of indigo threads you get from different pairs of jeans. Also, these tassels do feel very soft. 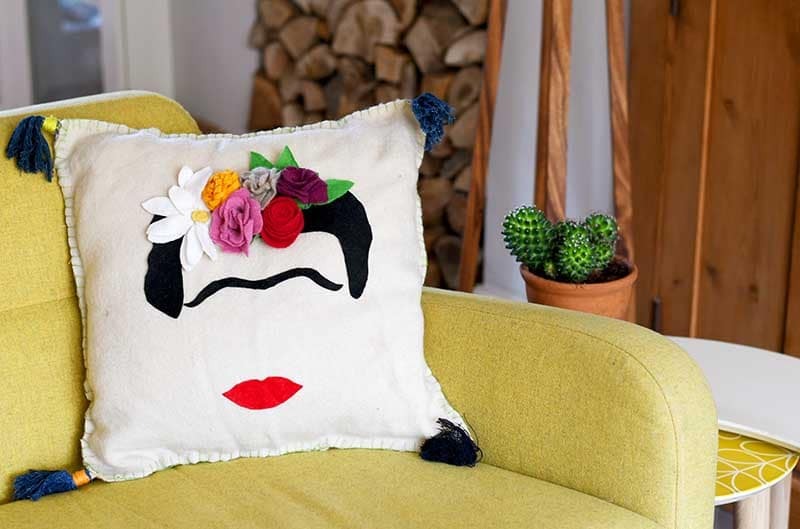 I’ve also put some of my denim tassels on my Frida Kahlo cushion as I thought they went well with it. I’m making a stack more denim tassels to fringe the recycled sweater blanket I made. I may even make a wall hanging from them. What do you do with your tassels? If you’re not sure there are some great ideas here. 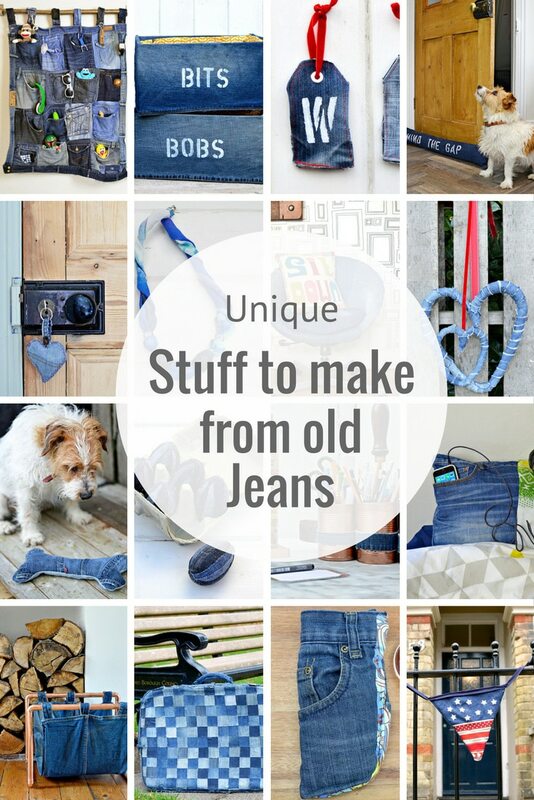 Don’t forget to check out all my other upcycled denim crafts and DIY’s and other ideas for using pom pom crafts and DIYs. I didn’t know that you could make the cutest tassels out of jeans. Love the bright colors with the denim. Thannk you. Yes they are fun to make too. Can’t wait to try this, thanks for the great ideas! Thank you, it was very therapeutic. I’m a bit of a fidget when watching TV so crafting with my hand helps. Who’d have thought jeans could be made into tassels. Such a clever idea, Claire. I could see these being added to denim bags, too. I’ll be showing this in my sidebar as a Free Featured Tutorial. Thank you Pam. I have big ones as door decorations as small ones trimming cushions and pillows. Others have used my tutorial to make denim earrings. These look great. Just pinned this article for later! What a fun upcycle idea! The tassels all look great. Thanks for sharing at Snickerdoodle. Pinning. Wow, these are brilliant! Thanks so much for the tutorial — I will be trying this one. Thank you so much and have fun making them. You had me at ‘denim tassel’! i am SO making myself some of these, not a clue what I will do with them but I feel that I NEED them in my life! Thank you, Julie. A repetitive but satisfying craft. Claire, I am so impressed with your vision when it comes to denim! 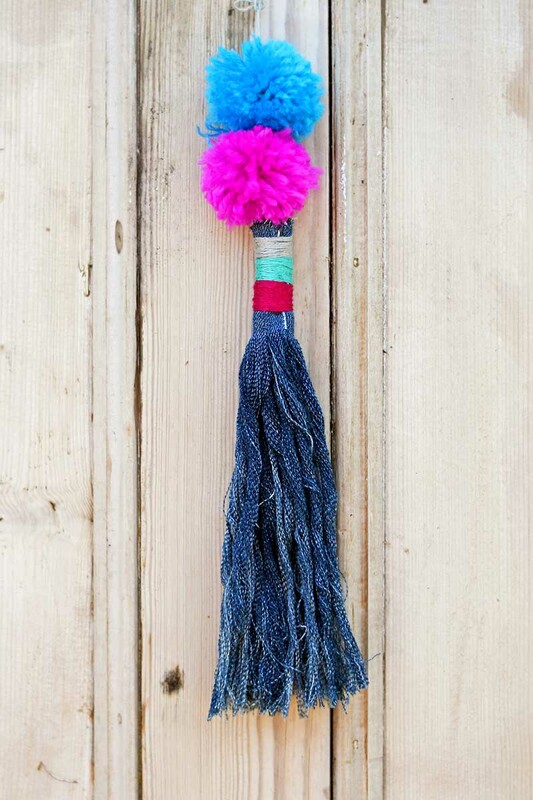 Thanks for sharing your adorable tassels at Vintage Charm! Pinned & tweeted! I love the jean tassels. Pinned.